Lowveld National Botanical Garden, Nelspruit, Mpumalanga. Satellite View is showing Mbombela (formerly Nelspruit), the capital of the Mpumalanga province in South Africa. The city is located in the north-eastern part of the country on the Crocodile River about 110 km (68 mi) west of the countries border with Mozambique and about 150 km north of Mbabane capital of Swaziland. 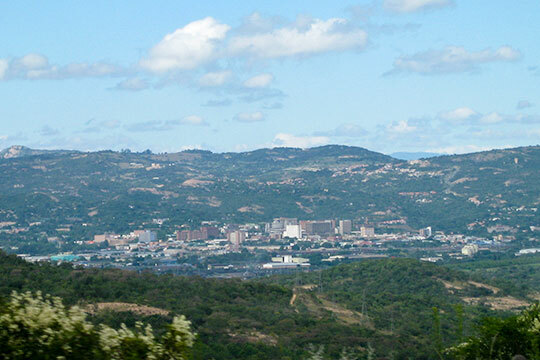 The City of Nelspruit was officially renamed Mbombela by the South African government in October 2009. The North Gauteng High Court in Pretoria ruled in 2014 that the name-change was legally. Mbombela has a population of about 58,672 inhabitants, 588, 794 people live in Mbombela Local Municipality. Spoken languages in Mpumalanga are Swati, Zulu, Tsonga, Ndebele, and Northern Sotho. The city is a center for manufacturing and an agricultural hub for northeastern South Africa. Mpumalanga's mild subtropical climate (winter months are June, July and August) facilitates the growing of citrus and tropical fruits, for this reason many fruit production farms settle in the area around Mbombela. Mbombela is a gateway to Mpumalanga province and a stopover point for tourists travelling to the Kruger National Park. The city was one of the ten venues for the FIFA World Cup 2010. When in Mbombela you may visit Lowveld National Botanical Garden, Montrose Falls (Crocodile River), Sudwala Caves and Dinosaur Park, the Kruger National Park one of the largest game reserves in Africa. and the location of Mbombela Stadium as well as Nelspruit Airport (IATA Code: NLP) southwest of Mbombela. Zoom out (-) to find Kruger Mpumalanga International Airport (IATA Code: MQP) north east of the city. Google Map: Searchable Map and Satellite View of the City of Mbombela (or Nelspruit), South Africa.